Farmersville residents packed the Farmersville Fire Hall Thursday night for a public hearing on a proposed new local law on wind turbines to accommodate the Alle-Catt Wind Farm spanning five towns in three counties. Most speakers were either opposed to the wind turbines, or asked for stricter limits on setbacks and noise. FARMERSVILLE – There was a sea of green T-shirts on both sides at Thursday’s public hearing on the proposed new Farmersville Wind Turbine law. 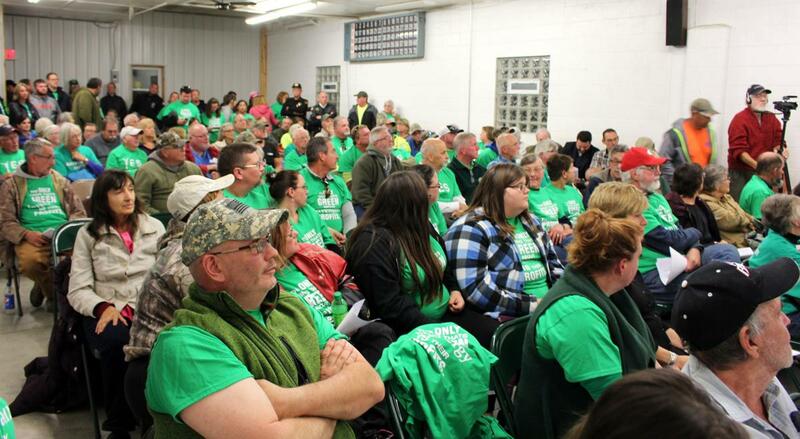 Supporters of the 120-turbine wind farm wore green T-shirts that said “Yes” on the front shaped like the blade of a wind turbine. Others had “Taxpayers United” on the front of their green T-shirts and reasons to support wind power on the back. The townspeople are as divided over the wind turbine issue as their T-shirts. Many opponents said they would probably move from the town if the 600-foot wind turbines are built. The 380-megawatt Alle-Catt Wind Farm would generate enough electricity to power 148,000 homes, according to Invenergy, the Chicago-based developer. In Cattaraugus County, Farmersville would have 23 wind turbines and Freedom would have 34. In Allegany County, Centerville would have 29 and Rushford 10. Arcade in Wyoming County would have nine. The Town of Farmersville would be in line for $360,000 a year from a payment in lieu of taxes agreement (P.I.L.O.T.) and a host community agreement. Freedom would get $450,000 a year, while the Pioneer and Franklinville school districts would get $330,000 and $100,000 a year respectively. Cattaraugus County would get $380,000 and Allegany County would get $300,000 under P.I.L.O.T.s. Opponents and those who wanted to place stricter limits on the wind turbine setback and noise level outnumber supporters. Nearly 200 people attended, with more outside who could not get in. The first speaker, Dorothy Bieber of Farmersville, set the tone for opponents and those seeking stricter limits on the turbines. “40 dBA (decibels) is not too much to ask for,” she said. The local law currently sets 50 dBA as the limit. Bieber and others sought an increase in the 900-foot distance to a property line.The proposed distance from a wind turbine to a residence is 1,800 feet, which many asked be raised to 3,000 feet. Attorney Ginger Schroder, a Farmersville resident representing Freedom United, approached the Farmersville Town Board with a letter from Amish elders saying they remain opposed to the wind turbines despite attempts by Invenergy to get them to change their minds on Wednesday. “They have not changed their minds,” she said. There are about 125 Amish residents, about 1/10 of the town population. Invenergy knows “the project is in jeopardy,” Schroder said. After meeting with Cattaraugus County Industrial Development Agency officials for five hours last week, Schroder said they will not talk about tax breaks for the project until next year, after the Article 10 procedure is completed. Cattaraugus County lawmakers voted last month to urge the IDA not to grant tax breaks to the project. One Farmersville woman said some people suffer from the infrasound produced by the whirling turbine blades racing at up to 160 mph. She questioned whether anyone would want to buy homes with 600-foot turbine towers next to them. Resident David Hughes said with three turbines across the road from his house, he and his wife “don’t think it will be healthy for the girls” and will move if the turbines are installed. Farmersville United President Mark Heberle said he was looking for a 3,000-foot setback, 40 dBA noise limit, no shadow flicker and a guarantee for property values. Lois Lane of Farmersville said she was in favor of the green energy from wind turbines, but urged the town board to negotiate for a better host community package. “Protect my property value,” demanded William Snyder. John Rose, a lifelong town resident, said he was “1,000 percent” opposed to the project. “I don’t want to see the damn things. I don’t want to hear them. I hope no one here has a vested interest,” he said. A new resident, Albert Brown, said the 600-foot towers for the turbines are not appropriate for the landscape. “It’s going to benefit a few at the expense of the many,” he said. Farmersville resident Dorothy Lockridge said board member Richard Westfall has signed leases with Invenergy for two wind turbines and board member Richard Zink’s in-laws have wind turbine leases in the town of Centerville. Both have remained active in the wind turbine law debate. They should recuse themselves, she added. However, Butch George, a Freedom farmer with property in Farmersville, said “this is one of the best things to happen” as it generates money for landowners and the town. Tom McHale, representing the laborers union, urged the town board to proceed with the local law. Invenergy, he said, had made a commitment to hire local labor. Also, Millard Brown of Laidlaw Road said the wind turbines will make some money for the town and the fire department. Eric Miller of Invenergy spoke of the $7 million in annual benefits‚ from the Alle-Catt Wind Farm including P.I.L.O.T. payments to towns, schools and counties, host payments to towns and payroll. Franklinville Supervisor Lori Fisher noted the Town of Farmersville did not complete the environmental assessment forms it sent to the Cattaraugus County Planning Board. The forms were rejected, she said. No court has approved a wind law where the municipality did not complete the forms. “Do your best job,” Fisher told Farmersville Supervisor Robert Karcher. Dan Spitzer, an attorney from Hodgson Russ representing Invenergy, said wind farms have improved many communities with a new revenue stream. Studies have found no harm from wind farms, he added. Another Invenergy attorney said any setbacks larger than 1.1 times the height of an extended blade from the ground would just reduce the number of turbines. Stephanie Milks, president of Freedom United, spoke in support of her Farmersville neighbors. A 3,000-foot setback from homes would reduce noise and flicker and “help us preserve our property rights,” she said. The town board will continue to accept comments for 14 days. The board doesn’t meet again until Nov. 19. It’s unclear whether the board will be ready by that time to approve the local law.